On Monday, the Eco Week launch is all about fair trade: Come and enjoy free fair trade All Good banana ice creams and free shots of fair trade Jail Breaker coffee in the Undercroft, 12 noon – 1.30pm. Tuesday is about Food Waste. Food Waste is a massive issue, which is getting more traction in Christchurch too. 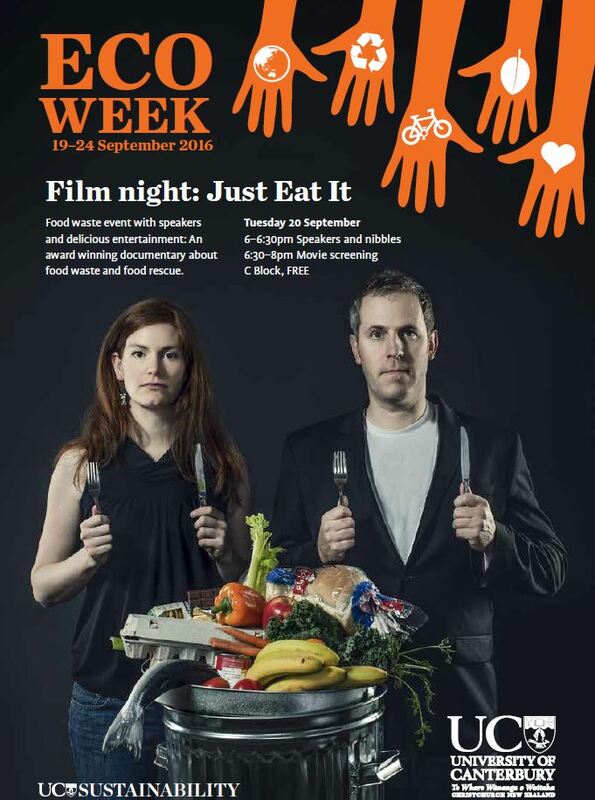 There will be a short food waste get-together with speakers (Cultivate Waste and Love Food Hate Waste) and nibbles, followed by a screening of the award-winning doco ‘Just Eat It’ – 6pm to 8pm (C Block). It’s free and non-UC folk are welcome too. On Thursday you can tour two Tiny Houses built by UC alumni. Tiny houses are hailed as one of the solutions to the housing crisis and as a way to live more sustainably. The Tour leaves at 1.30 (meet Katie at Science Road Car Park), back at 4pm. 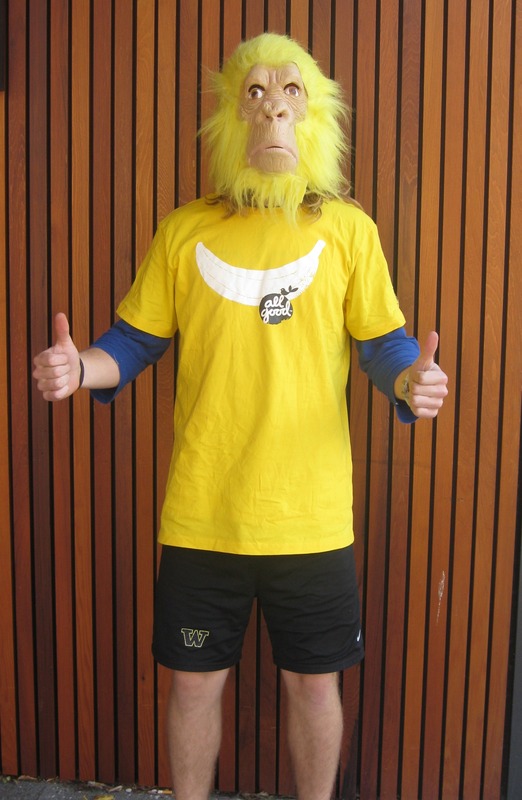 Booking is essential though, so email ecoweek@canterbury.ac.nz asap if you are keen! On Friday, you can learn about where to find free food on UC campus when you join the Edible Campus Tour. Did you know there are lemons, olives, walnuts, figs and more growing all over campus and that it’s all free to eat? Find out where and finish at UC’s Okeover Community Gardens. Meet tour guide and community gardener Jane Aistrope outside Café 1894 at 12 noon sharp. In the late afternoon, come celebrate student and staff achievements in sustainability at the 2016 Sustainability Awards ceremony. The Sustainability Awards recognise the efforts of our university community to improve the world around us. They will be held at Undercroft 101 – 5.30pm to 6.30pm. Nominations still open til 31 August. Download the nomination here. And finally, on Saturday, UC’s very first Sustaina-ball presented by the UC Eco Club Network. Visit here for more information. The ball will be held at Bentley’s (UCSA events centre) from 7.30pm to late. During Eco Week some UCSA clubs will also be holding events: for instance, VCUC will screen Cowspiracy on Monday, GEOSOC is planning a Quiznight on Wednesday and the UCSA will run an eco mug scheme at cafe 1894. To keep in touch with all events, subscribe to events on the UC Sustainability Office Facebook page. (Click Events and click Subscribe 🙂 Easy), or check out the events section on the UC Eco Club Facebook page. As part of Eco Week 2016 (September 19-24), the Sustainability Office is holding the Sustainability Awards, celebrating the efforts of our university community to improve the world around us and make UC more sustainable. In the same spirit, we are profiling some sustainability efforts of UC students and departments. IT Services have been doing brilliant work with their IT Recycling Service. Over 2015 they diverted about 18550 kg of IT equipment from landfill. We had a chat with Brad Ash about what they are doing and why. What do you do at UC, Brad? I am an IT Technician for Technical Support, my normal role is processing Hardware Servicing Events for IT equipment but I am currently overseeing the IT Recycling Service. Also, Ruth Emmens and Joseph Yamit have stepped up to learn the Recycling Process, more hands on deck are always welcome! What is the IT Recycling Service and what is its purpose? The service is a collaborative effort between ITS, Distribution Services and Financial Services, providing the University with a sustainable, ethical means to dispose or re-purpose UC-owned equipment that no longer meets current business requirements or expectations. As an example, this would include items such as: a PC that is older than four years (fully depreciated); broken phones, keyboards and cables; or surplus IT equipment gathering dust at the back of the office cupboard. IT recycling requests are initiated via the Self Service Portal. Given the volume of equipment we process, I would like to encourage readers new to the service to understand the following outline of service expectations. What is the IT recycling process? During the processing stage, we tag the items with either green redeploy or red eWaste stickers. Items which we deem as re-deployable (e.g. Philips 22” Monitors) are tested, cleaned, electrically safety tested and asset tagged if applicable. These are then assigned to Colleges to replace items that are definit ely eWaste. Components are used from re-deployable equipment to cater for Hardware Service Events where the Warranty has expired but the item is still economical to repair. Items with eWaste stickers are passed to our Recycler and are mostly broken down into components which are processed at Metal Recyclers. Some items or parts are kept in stock and are passed on as donations for primary schools as an example. All data is removed from any Hard Drives in Computers that are eWasted. Why is the IT Recycling Service important? The IT Recycling Service is important for the University as a whole as each item is removed from the Universities financial records when we confirm that it has been disposed of. It is important for us at Technical Support because we can use parts from redeployed computers for service events, and do upgrades at no cost. 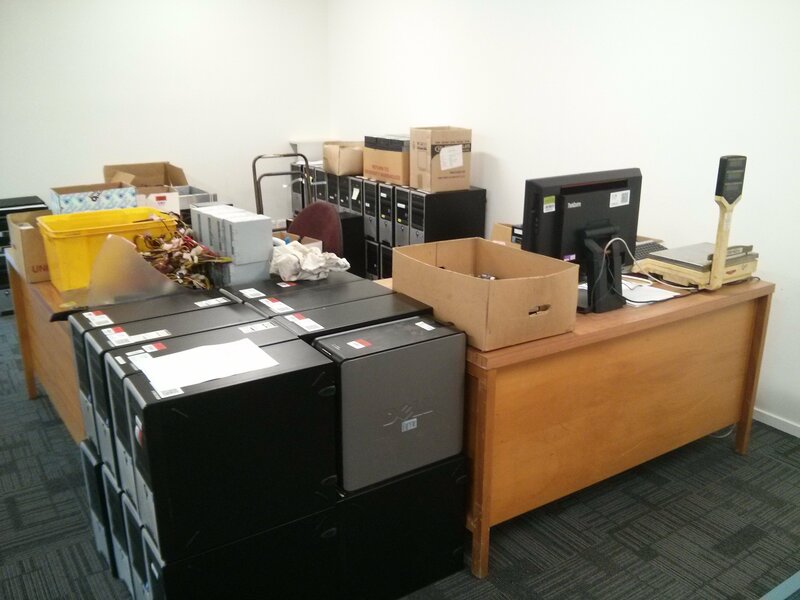 Also, it allows us to assist Colleges that are low on budget, by replacing eWaste equipment with redeployed equipment. And of course it is important environmentally, with less eWaste ending up in landfill. How is it going with the service? The Service is going well, numbers started high since proper reporting begun in 2013. They are dropping slightly yearly, and we assume this is happening because the eWaste that Colleges have stored over the years are gradually being processed. Eventually, the numbers should mirror the equipment replacements that happen each year. In 2015, a total of 2,383 items were processed which saved the University $5,250 in landfill costs. This price includes skips being hired and the cost per KG for disposal, this doesn’t include the effort from staff to actually dispose of the equipment at the Refuse Station. Eventually, we should not dispose of equipment in the Landfill anymore at all, we should always attempt to dispose of items in a sustainable manner. The process is constantly evolving to have minimum input from required members but to keep up the high standard of reporting, and less paperwork is always a good thing. Are there other sustainability-focused improvements/initiatives you are looking at for the future? Nothing planned right now, but about mid-way through 2014, we started exchanging selected eWaste, “All In One” computers from student workrooms, for “repair credit” with a service agent. This gives us repair credit that we use for Mobile Phone and Tablets repairs. So far, cost savings have been approximately $4200 for 2015. So remember, if you drop your work Phone or Tablet, log a job through the Assyst tool and we can assess it for you! Any other messages for staff ? What we ask at the moment is for Colleges to please refrain from holding on to eWaste equipment ‘just in case’. Please log a Recycling job through the Assyst Self-Service Tool for eWaste processing. And if you require equipment where new purchases are not viable, please log an Assyst job and we can most likely provide a solution for you. Since we started reporting on the number of redeployed Computers passed on to Colleges in mid-2015, we have re-assigned 310 Computers (mostly for Engineering Post Grad workroom replacements). Please click here for more information on the UC IT Recycling website. UC Eco Week 2016 is a festival of events that celebrate and promote what you can do for the environment, your community and your life. See our webpage for updates on the events or see the event listing here. Did you know that UC has a Sustainability Office? We are an on-campus hub for individuals and groups that are interested in creating positive change and promoting sustainable practices within UC and the wider community. We organise events (e.g. Ecoweek with lots of sustainability focused events); we communicate pathways for change (like, promoting fair trade, sustainable transport, informing staff and students about recycling), and support a network of individuals and working groups across the campus and in the wider community (for instance, we provide input into the campus master plans, and we work closely with the student Eco Clubs). We also organise exciting projects, like the compositing coffee cups trial for instance, or Dr Bike. Our whole team is passionate about sustainability. Jane looks after the Community Gardens at UC (with a group of students), Katie is focused on waterways, tiny houses and fair trade, Matt is finding more and better ways to look after cyclists and handle waste (think worms and composting), and Puck works on different sustainability projects and does the communications side of things. This November, New Zealanders have an amazing opportunity to start thinking exponentially at Australasia’s first ever SingularityU Summit. The world’s experts on exponential technology will get together in Christchurch with New Zealand and Australia’s leaders of today and tomorrow to talk about what lies ahead. The Summit will provide business leaders, innovators, entrepreneurs, not for profits, start-ups, educators and youths the insight and knowledge they need to compete – and win – in an exponentially changing world. Be a part of a conversation that won’t wait. Early bird tickets on sale until 31 August. Special prices available for age 25 and under, as well as start ups, educators and not for profit. A real life situation of climate change induced sea level rise, in Bangladesh is documented in the United Nations Development Programme commissioned film, Thirty Million. This seminar (Thursday 8 September) from climate change talks by Professors Tim Naish & James Renwick of Victoria University, Wellington and Jo Tyndall of Ministry of Foreign Affairs and Trade. The film was produced by UC graduate Dr Daniel Price, resulting from his Pole to Paris campaign where he biked across the globe to raise awareness of climate change, after completing a PhD in Antarctic Studies. His Antarctic experience highlighted the effect climate change will have on Antarctic ice and the potential for sea level rise in a warming world.